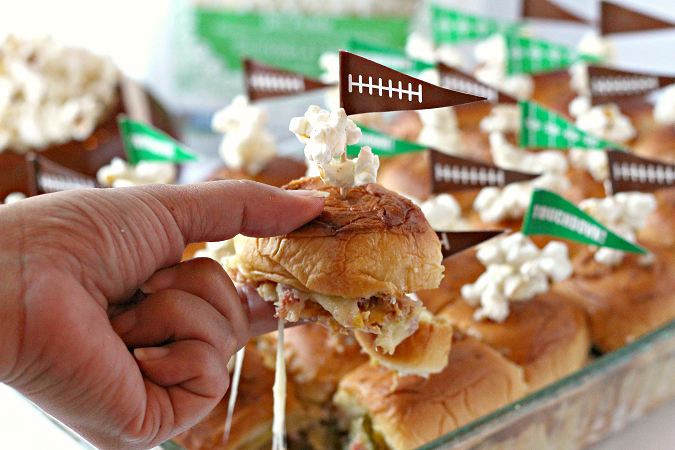 Wow your next football party with these Easy Cuban Sliders for Game Day. Make the recipe & enjoy this easy appetizer idea. This post is sponsored by G.H. Cretors. All delicious opinions are my own. It’s the season for my 3 favorite “F’s.” Fall, football and FOOD! I’ll admit that when game day is here, I’m rooting for the food! And today I’ve got a touchdown of a recipe for you. If you love a good Cuban sandwich, be sure to add these Easy Cuban Sliders for Game Day to your recipe list. This easy appetizer idea combines the classic flavors you love with an extra “POP” of flavor and a side of crunch! Did you say, extra dill pickles? Yup, I agree. My favorite part of a really delicious Cuban sandwich? The pickles, of course! Having the right crunchy dill pickle can make or break this appetizer. So how do I make sure that these Easy Cuban Sliders wow the hungry crowd? With G.H. Cretors Organic Dill Pickle Popcorn! 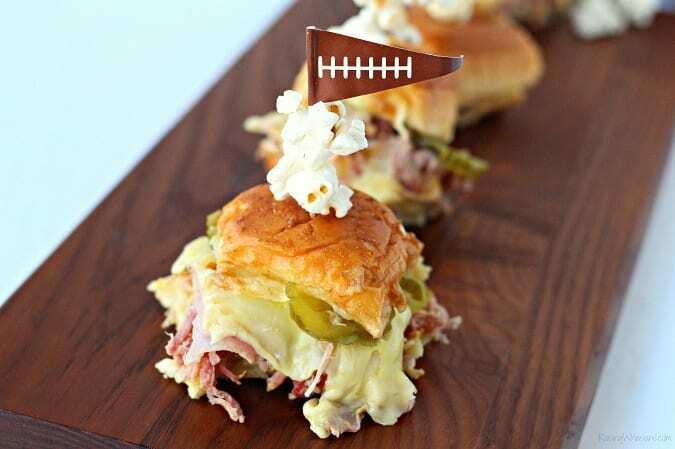 The extra dill pickle flavor combined with popcorn crunch in every bite make these sliders absolutely irresistible to our big game day fans. Just add a few delicious pieces to the top of your slider for the extra “POP” of dill pickle flavor. YUM! 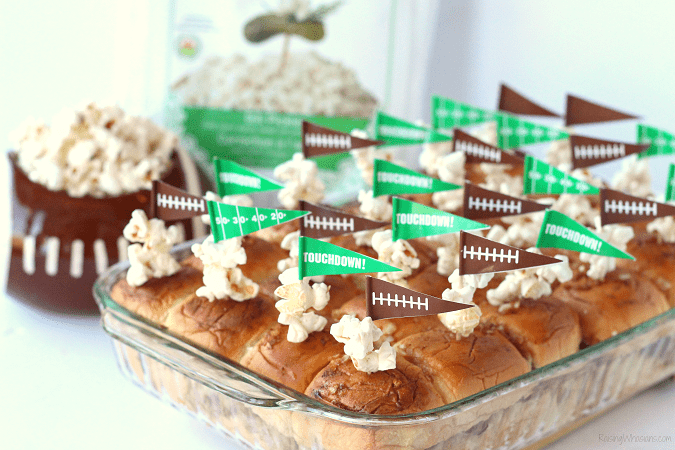 Ready to make a touchdown at your next football party? Grab the recipe for these Easy Cuban Sliders. Don’t forget the dill pickles! Cut and separate the tops of the rolls from the bottoms. Place the bottom rolls in a sheet pan or casserole dish. Layer mustard, pulled pork, ham slices, cheese and pickles on the sliders. Cover with the tops of the rolls. In small bowl, add butter, onion, dry mustard, Worcestershire, and garlic powder. Heat mixture in microwave about 20-30 seconds on high or until melted. Stir until combined. Brush tops of rolls with butter mixture. Cover sliders with foil. Bake for 10 minutes covered. Uncover and back for about 10-15 minutes longer, or until cheese is melted and tops of rolls are golden brown. Top each slider with toothpick holding 1-2 pieces of dill pickle popcorn. Bet you can’t eat just one! These delicious and easy Cuban sliders are the perfect hearty appetizer for all of your football games this season. Topped with a delicious dill pickle crunch thanks to G.H. Cretors Organic Dill Pickle Popcorn, your guests will love gathering together for these little bites. Go Food Team! Are you a big fan of TV and snacks too? Stock up on G.H. Cretors Organic Dill Pickle popped corn for your Easy Cuban Sliders for Game Day and all of the delicious G.H. 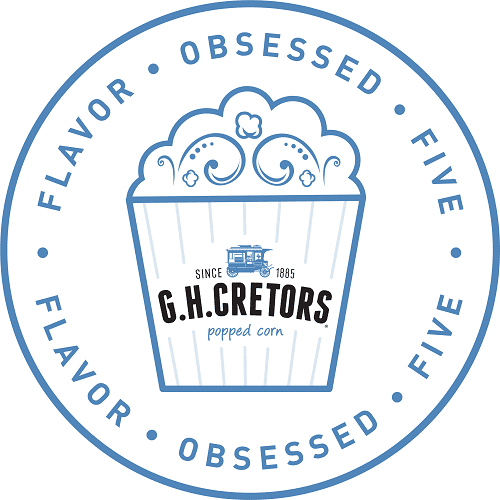 Cretors popcorn varieties at your local G.H. Cretors’ retailer. 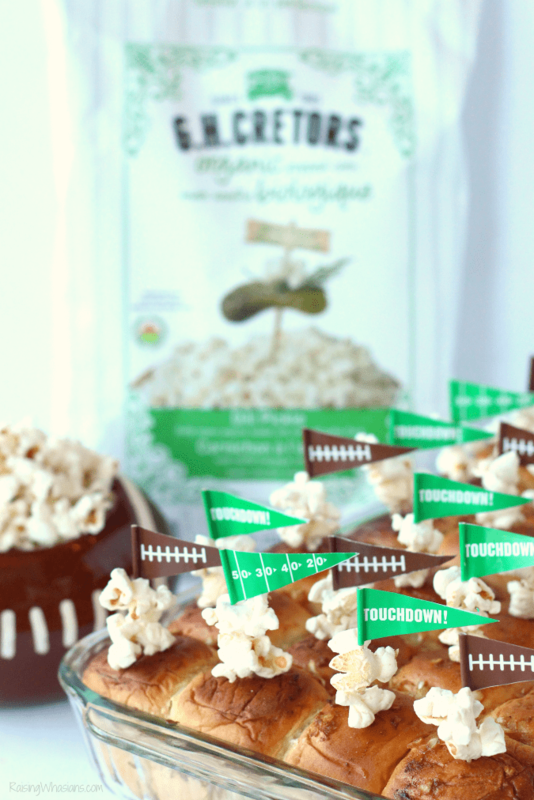 It’s the perfectly delicious snack choice for your next football party! And follow G.H. Cretors via Facebook, Twitter, Instagram and Pinterest for delicious popcorn inspiration, new flavors and more. Be on the lookout for more delicious recipes and popcorn inspiration at Raising Whasians, coming soon. I’m so excited to be a G.H. Creators Flavor Obsessed Five Ambassador for 2017-2018! 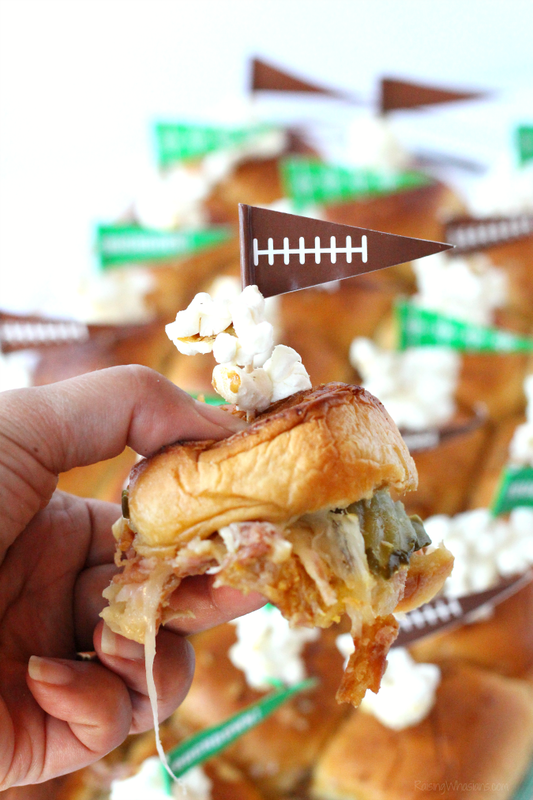 Would your football fans love these Easy Cuban Sliders for Game Day? 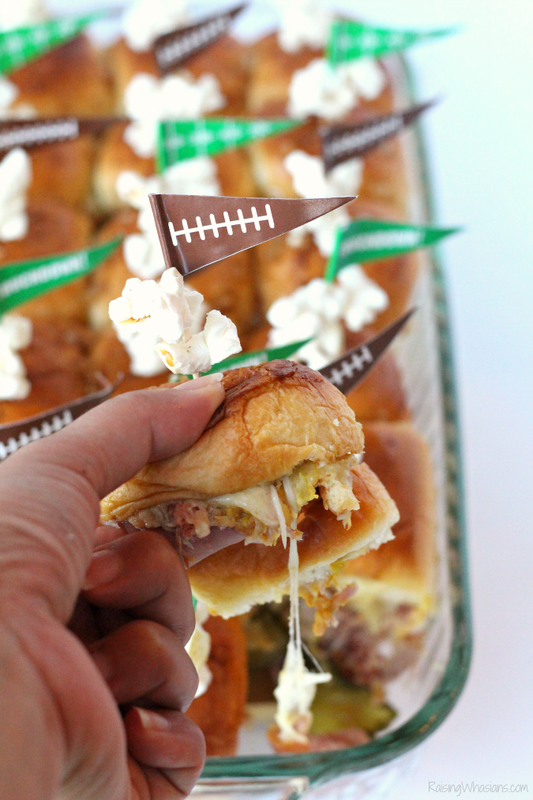 What appetizers do you love for your game day crowd? Be sure to follow Raising Whasians via Facebook, Twitter, Google, Instagram, Pinterest and YouTube for parenting tips, free printables, kids crafts, recipes and more. Sliders seem to be all the rage right now! I like this recipe for it’s originality. Looks super simple to make. Those look amazing! The melty factor is impressive. I can’t wait to make these! I LOVE Cuban sandwiches! They are heavy on the cheese and the flavor. This slider version looks amazing! Thank you! I am drooling! These look wonderful—I’m not waiting for game day! These are not only perfect for game day, but ANY day! They are right up our alley!! These look delicious and absolutely great for game day! The dill pickle popcorn is such a fun added touch. This is such a good idea for game day! I’m liking the dill pickle flavor a lot! I think these would be a hit. Oh these pictures are making my mouth water, I’m a sucker for sliders. I am LOVING those cute little flag toothpicks with the popcorn! I would have never thought to add that but it totally works! Cuban sandwiches are my fave and you’ve made them even better by making them bite size! These Cuban Sliders are going to be perfect for Game Day. We are planning a few get togethers for this season. That looks amazing! I love the serving size because it’s not too big and it’s not little as well. It’s definitely perfect for filling up your tummy while watching the game! Oh I so want some of these! They literally look so good! These look so good. I love the addition of the dill pickle popcorn on the little skewers. You can’t have game day without sliders! These Cuban sliders would be gobbled up in no time at our party! These sliders look super delicious! I am so writing this recipe down! This looks so delicious! Also looks easy to make. Perfect for the holidays! These are such a great idea for game days! My husband will be thrilled when I whip some of these up. That popcorn looks especially great! I need to get some of that! Oh goodness. You had me craving for sliders at this time of night! I love the simple recipe for your Cuban sliders. My family would love this, game day or not! These look delicious! Such a perfect appetizer for game day! The popcorn on top is genius! A little crunch and some extra flavor on top of the already amazing sounding sliders. Plus, they’re so cute! Oh boy do these Easy Cuban Sliders look delicious! My husband would absolutely devour these! 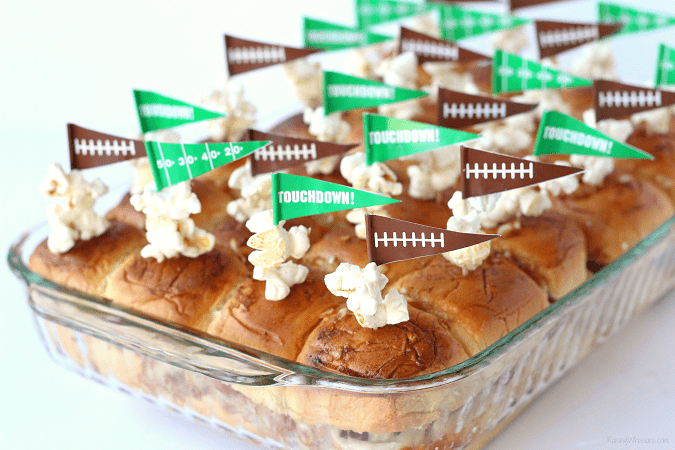 These look and sound like a yummy recipe to enjoy for football season! I would love to try making these sometime. These look great and are perfect for game day. I love the addition of the extra pickles! These look so good especially on sweet rolls. These sliders look delicious. I love trying new recipes so I will make these for the guys watching the games. They would be a hit here. Thanks for the recipe. 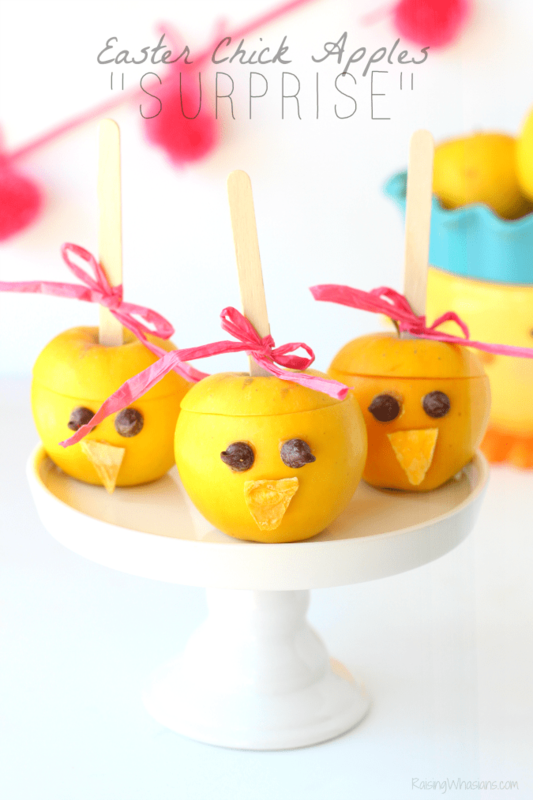 What a cute idea and delicious recipe! These look so yummy and I want to try them very soon! These sliders look so delicious. What a great recipe to try out on game day! These are the cutest Cuban sandwiches! I just love how you topped it with popcorn. Also, you can never get enough pickles in my house. We love them. This is perfect Super Bowl food! I love cuban sandwiches! I will absolutely be making this recipe! Oh my gosh, I just bookmarked this. It looks so delicious… Thank you for this blog post.